Extremely heavy infantry. High defensive skills combined with regeneration capability and huge size scare enemy troops which makes Wild Trolls one of the strongest infantry units. They are efficient in attack and even more efficient in defense of fortresses. Mages had studied trolls and made the conclusion that trolls are just wild animals with a slight trace of intellect. Also they found that trolls prefer to live in mountains and aren't very friendly creatures. Orcs don't need to know, whether trolls have an intellect or not. They use trolls for their great strength and vitality. 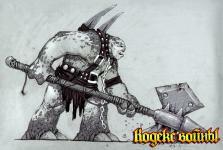 In a battle wild trolls don't carry any weapon but simply crush enemies with their rock hard fists.